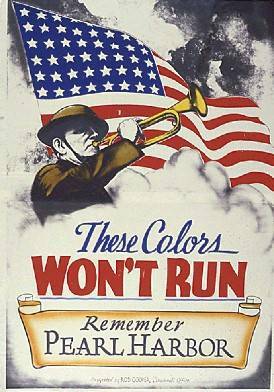 December 7th, 1941 -Pearl Harbor Remembrance! 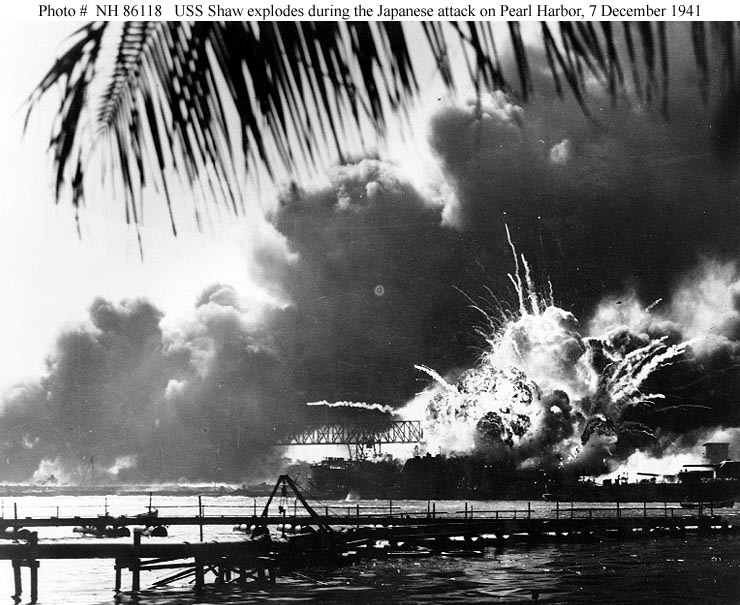 Japanese Admiral Isoroku Yamamoto planned the Pearl Harbor attack. 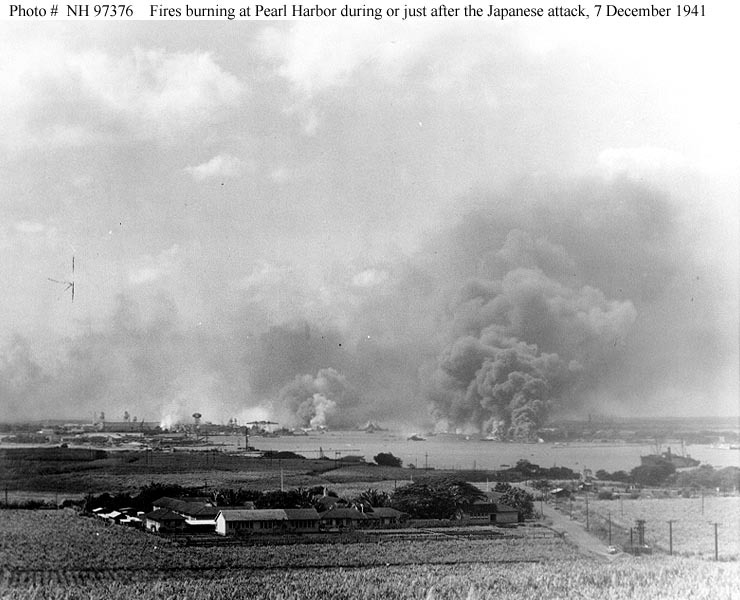 Two things inspired Yamamoto's Pearl Harbor idea: a prophetic book and a historic attack. The book was The Great Pacific War, written in 1925 by Hector Bywater, a British naval authority. It was a realistic account of a clash between the United States and Japan that begins with the Japanese destruction of the U.S. fleet and proceeds to a Japanese attack on Guam and the Philippines. When Britain's Royal Air Force successfully attacked the Italian fleet at Taranto on November 11th, 1940, Yamamoto was convinced that Bywater's fiction could become reality. On December 6th, 1941, the U.S. intercepted a Japanese message that inquired about ship movements and berthing positions in Pearl Harbor. The cryptologist gave the message to her superior who said he would get back to her on Monday, December 8th. On December 7th, a radar operator in Oahu saw a large group of airplanes on his screen heading toward the island. He called his superior who told him it was probably a group of U.S. B-17 bombers and not to worry about it. 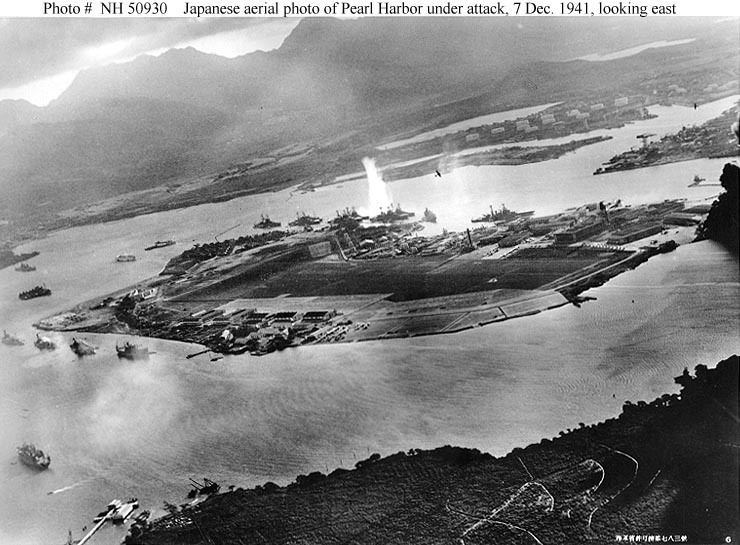 The Japanese attack on Pearl Harbor began at 7:55 A.M. on December 7th, 1941. The entire attack took one hour and 15 minutes. Captain Mitsuo Fuchida sent the message, "Tora, Tora, Tora," to the Japanese fleet after flying over Oahu to indicate the Americans had been caught by surprise. 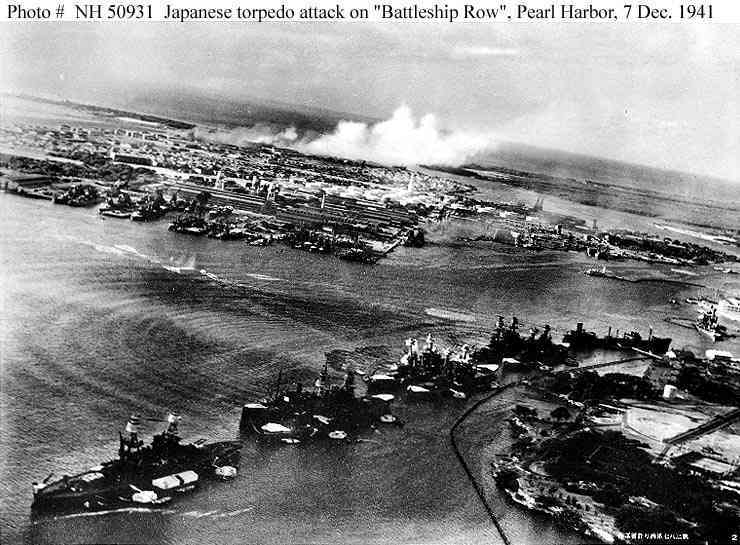 Yesterday, December 7th, 1941 - a date which will live in infamy - the United States of America was suddenly and deliberately attacked by naval and air forces of the Empire of Japan. A messman aboard the U.S.S. Arizona, Dorie Miller, had his first taste of combat at Pearl Harbor on December 7th, 1941, when he manned a machine gun and shot down four Japanese planes. Born on a farm near Waco, Texas in 1919, Miller was the son of a sharecropper, and grew up to become star fullback on the Moore High School football team in his native city. At 19, he enlisted in the U.S. Navy, and was nearing the end of his first hitch at the time of the Pearl Harbor attack. 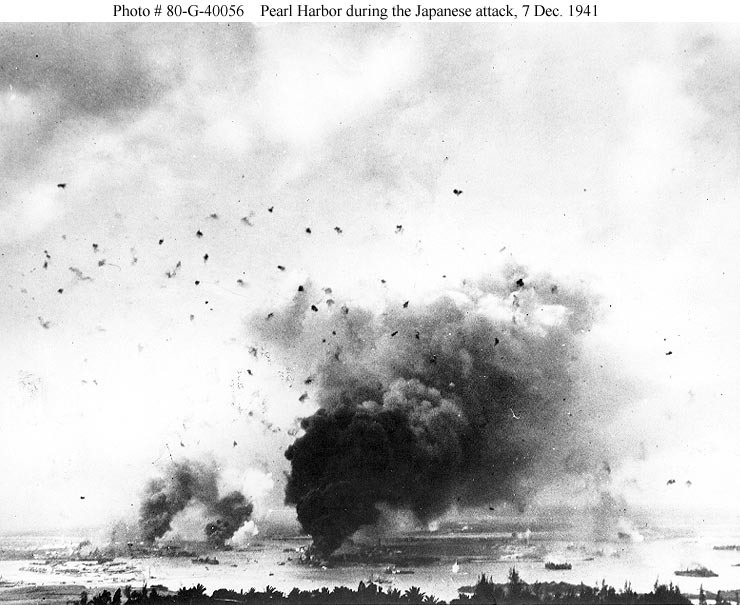 On the infamous morning of December 7th, 1941, Japanese bombers and fighters flew over Pearl Harbor and rained a hail of bombs and bullets on the slumbering U.S. Navel base there. 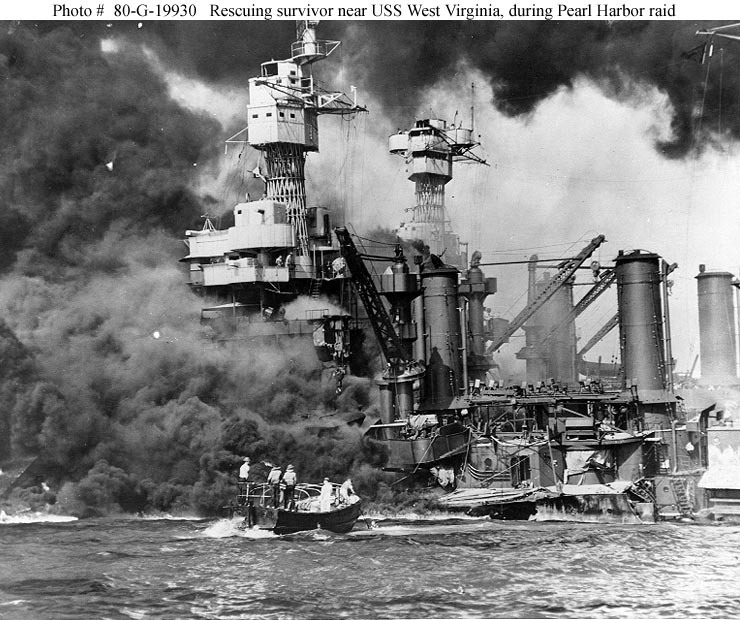 Among the battle vessels sunk and reduced to helpless hulks was the U.S.S. Arizona, the ship on which black messman Dorie Miller was routinely going about his duties collecting laundry when the ear-splitting sounds of battle sirens and exploding shells rent the air. Miller rushed up on deck, and instantly hauled his wounded Captain to safety. Moments later he sprang into action behind an anti-aircraft gun he had never been trained to operate. Firing calmly and accurately, he shot down four zero fighter planes before the cry to abandon ship was heeded by all survivors. On May 7th, 1942, messman Dorie Miller was cited for bravery by Admiral Chester Nimitz, Commander-in-chief of the Pacific Fleet, who decorated him with the Navy Cross and in doing so acknowledged the nations debt to a black man of extraordinary courage. The medal did not bring with it an instant promotion, or a transfer to a line of duty, which might have been more in keeping with Millers demonstrated aptitude or preferences. After returning from a trip back to Harlem, in New York City, where he drummed up support for the purchase of U.S. War Bonds, Miller yearned to get back into action. Remaining a messman during the hostilities while aboard the aircraft carrier Lescome Bay, he was subsequently promoted to mess attendant Third Class. He was killed in action in the South Pacific in December of 1943, when his ship was torpedoed by a Japanese submarine. Sailors on board the USS Hoel saw smoke and flame rise at least a thousand feet when the torpedo ripped into Liscome Bay and detonated her bomb magazine. At 0533, Liscome Bay listed to starboard and sank (in 23 minutes), carrying Admiral Mullinnix, commander of the Air Support Group, Captain Wiltsie, 53 other officers, and 591 enlisted men down with her. 272 of her crew were rescued. 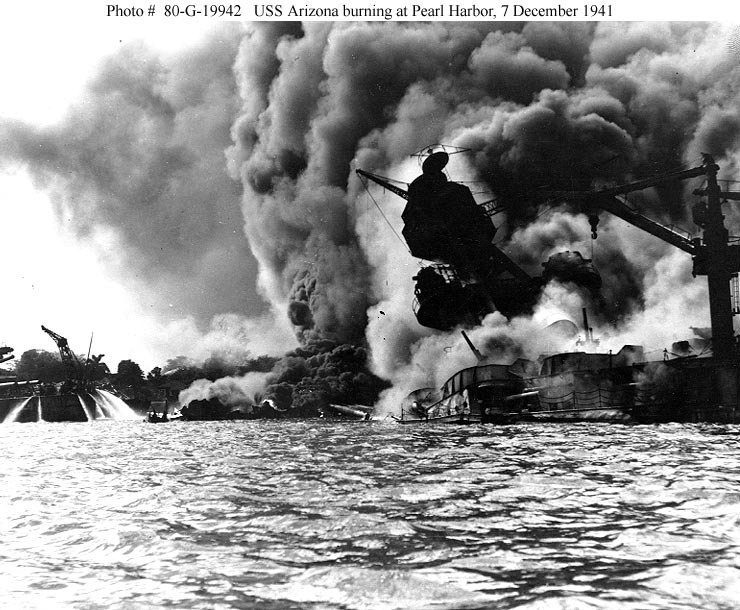 The American losses sustained at Pearl Harbor on December 7, 1941, were staggering. The United States lost 160 planes to the sneak attacking Japs, and in the confusion of battle five aircraft from USS Enterprise were shot down by friendly fire. 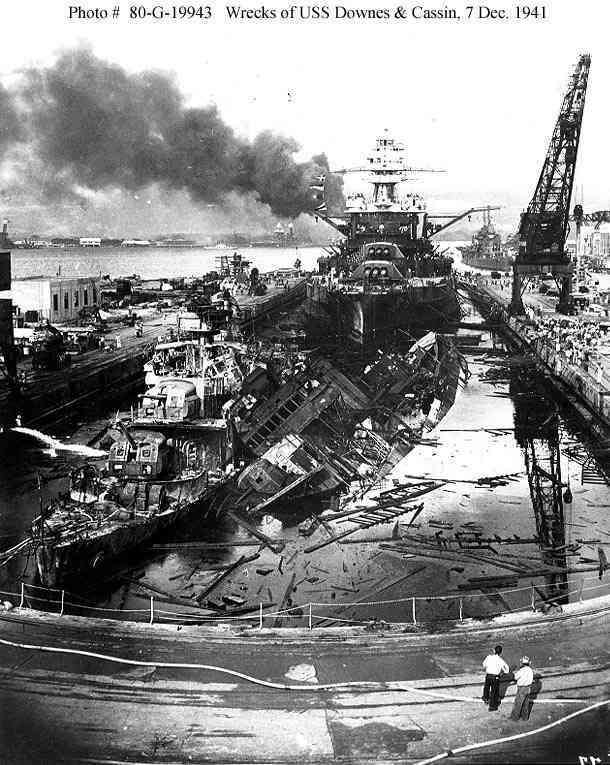 Eighteen ships were sunk or damaged, including USS Arizona, the pride of the Pacific Fleet. The dock and hangar facilities were so twisted and mangled that it took months to repair them. In terms of manpower lost, American casualties totaled 3,581. The effect on morale throughout the nation was devastating. 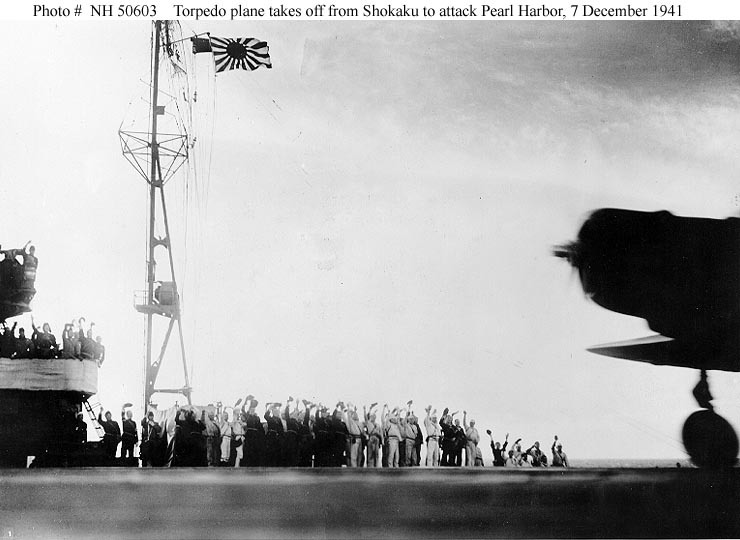 The Japs lost 29 planes and 55 airmen. America's situation could have far worse at the end of 1941 if American aircraft carriers had been at Pearl Harbor. Thank God our carriers were at sea which some months later allowed for the incredible, daring Doolittle Raid on Japan's mainland, April 18th, 1942. Lieutenant Colonel James H. Doolittle (left front), leader of the attacking force, and Captain Marc A. Mitscher, Commanding Officer of USS Hornet (CV-8), pose with a 500-pound bomb and USAAF aircrew members during ceremonies on Hornet's flight deck, while the raid task force was en route to the launching point. Lieutenant Colonel James H. Doolittle, USAAF (front), leader of the raiding force, wires a Japanese medal to a 500-pound bomb, during ceremonies on the flight deck of USS Hornet (CV-8), shortly before his force of sixteen B-25B bombers took off for Japan. The planes were launched on April 18th, 1942. The wartime censor has obscurred unit patches of the Air Force flight crew members in the background. Japanese friendship medal heading back to Tojo air mail. USAAF aircrewmen preparing .50 caliber machine gun ammunition on the flight deck of USS Hornet (CV-8), while the carrier was steaming toward the mission's launching point. Three of their B-25B bombers are visible. That in the upper left is tail #s 40-2298, mission plane # 6, piloted by Lieutenant Dean E. Hallmark. That in top center is tail # 40-2283. It was mission plane # 5, piloted by Captain David M. Jones. Both attacked targets in the Tokyo area. Lt. Hallmark, captured by the Japanese in China, was executed by them at Shanghai on 15 October 1942. USAAF aircrewmen preparing .50 caliber machine gun ammunition on the flight deck of USS Hornet (CV-8), while the carrier was steaming toward the mission's launching point. Ammunition box in center is marked "A.P. M2, Incndy. M1, Trcr. M1", indicating the ammunition types inside: armor piercing, incendiary and tracer. Note wooden flight deck planking, with metal aircraft tiedown strips in place of every eighth plank. Sabine (AO-25) refuels Enterprise (CV-6) in rough weather, during the approach phase of the Doolittle Raid on Japan, April 17th, 1942. Note configuration of refueling gear, and spare anchor stowed on the oiler's after superstructure bulkhead. USS Hornet crowded with 16 B-25 heads toward Tokyo. On route to Tokyo, the task force was joined by Admiral William 'Bull' Halsey on board the Enterprise which would finally provide it air cover the rest of the way. Each of the remaining raiders successfully launched despite stormy seas. B-25 lifts off from USS Hornet on Doolittle raid of Tokyo. Doolittle's B-25 waits for the signal from Lt. Edgar Osborn before taking off from the USS Hornet on April 18th, 1942. Lieutenant Colonel James H. Doolittle, USAAF, (center) with members of his flight crew and Chinese officials in China after the 18 April 1942 attack on Japan. Those present are (from left to right): Staff Sergeant Fred A. Braemer, Bombardier; Staff Sergeant Paul J. Leonard, Flight Engineer/Gunner; General Ho, director of the Branch Government of Western Chekiang Province; Lieutenant Richard E. Cole, Copilot; Lt.Col. Doolittle, Pilot and mission commander; Henry H. Shen, bank manager; Lieutenant Henry A. Potter, Navigator; Chao Foo Ki, secretary of the Western Chekiang Province Branch Government. Of the 80 raiders, three died as a result of their landings and eight were captured by the Japanese. The rest escaped to friendly territory with widespread help from courageous Chinese townspeople perhaps hundreds of thousands of which would soon be killed by the Japanese Army in retribution. One of the pilots, Ted Lawson who flew plane #7 the ruptured duck -- would see his story published a year later and a year later that Hollywood had made it into a movie with Van Johnson, Spencer Tracy and Robert Mitchum (i.e. 'Thirty Seconds Over Tokyo'.) Doolittle, who was sure he would be court-martialed for having lost all his planes, was instead awarded the Medal of Honor, promoted to brigadier general and given command first of the 12th Air force in North Africa, then the 14th in the Mediterranean and finally the mighty 8th in England and Okinawa. Location where three American flyers were executed by the Japanese as war criminals (above). Despite his horrific experiences as a POW, raider Jacob DeShazer (in both photos) after the war returned as a missionary to Japan and helped convert -- among others -- Mitsuo Fuchida to Christianity. 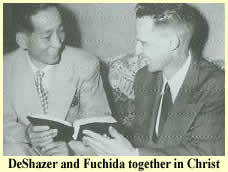 Both men remained friends until Mr. Fuchida passed on. I lifted the curtain of warfare by dispatching that cursed order, and I put my whole effort into the war that followed. Captain Fuchida had many close brushes with death, including six crashes at sea. Shortly before the battle of Midway he underwent an appendectomy on board ship. Though he did not fly, he was in the thick of that battle. A bomb-hit on his ship broke both his legs and hurled him into the sea, from which he was rescued and sent back to Japan. Had he not been out of action he would have commanded the Japanese air force at Guadalcanal and might well have met the fate of many of his fellow officers who died there. When I began the research for this posting a very different ending was in mind. Being totally unaware of the what transpired between Jacob DeShazer & Mitsuo Fuchida, the ending was changed to what you see. My conclusion is, if these two men could forgive each other, anyone can. Very nice photo essay except... On December 7th, a radar operator in Oahu saw a large group of airplanes on his screen heading toward the island. 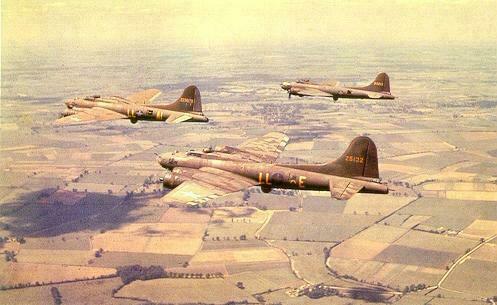 He called his superior who told him it was probably a group of U.S. B-17 bombers and not to worry about it. The photo is of B24 Liberators. Not much play in the Press. Excellent. Very well done. Thank you. That was my fault since the photo of the three Liberators would fit size-wise. Not kosher, I know. For graphic effect only. My mother saw the attack first hand. She was 10 years old living in Pearl City. The following link is of my grandfather that I registered at the WWII Memorial in Washington D.C. I wrote a letter to the editor of the Jackson Mississippi paper 13 years ago during the 50th Anniversary of the Attack on Pearl Harbor when it seemed that the paper's political cartoonist was making light of the number of TV specials. It would sadden the WWII generation to know how many kids today know more about Sponge Bob than about Pearl Harbor. Has there been an effort to upgrade Miller's medal to the Medal of Honor? It seems to me that he would qualify for it. Any comments would be welcome. My father served in the pacific theatre from '42 to '45 as a USN MM aboard the USS Cogswell (deisel-powered destroyer). He's gone now, and I have in my keeping many momentos and artifacts from that war. The places his battle group went reads like a who's-who of the entire war in that part of the world. Just this morning I was telling my 6-year-old son about the importance and significance of this day. When he gets home from school this morning, I will be showing him this thread to further his education on this day of great sacrifice and courage. Thank you for an outstanding post. You may enjoy this rest of the story by Paul Harvey titled "Surprise Attack". Beginning in 1931 and for the next decade, the same question appeared on every final exam for each graduating class of Japans Naval Academy. When that question first appeared on the exam, there was no correct answer. Then in February of 1932, nine years and ten months prior to the real attack on Pearl Harbor, the Japanese discovered what they believed was a foolproof plan. That strategy was in fact the one they eventually employed. Yet for nine years more, the question How would you carry out a surprise attack on Pearl Harbor? appeared on the Japanese Naval Academy final exam. With literally hundreds of various suggestions, gleaned from the fertile minds of Japanese youth, not one could rival the strategy of the 1932 plan. How they really surprised us at Pearl Harbor is the rest of the story. 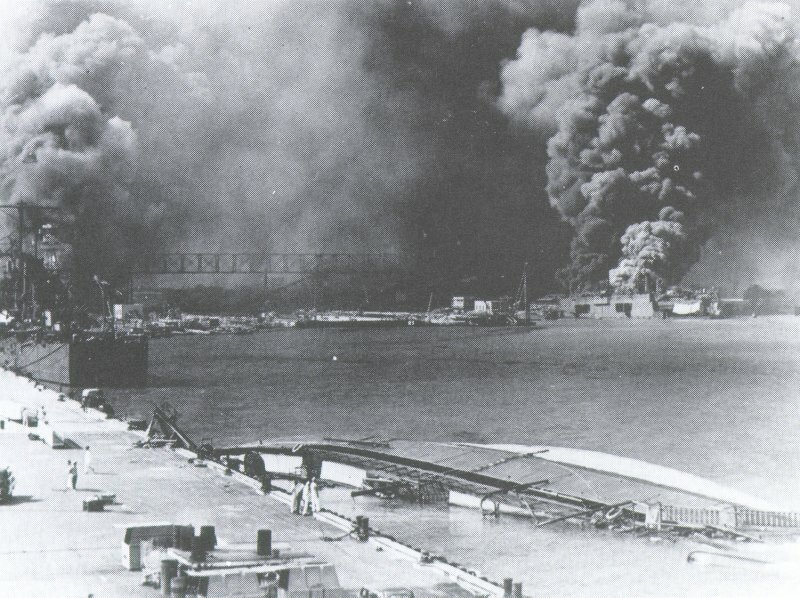 In the fall of 1941, a Japanese ship arrived at Honolulu. Four members of the crew, who were posing as stewards, were really officers in the Japanese Imperial Navy. Two submarine experts and two surface ship and air operation experts. Had we been more suspicious at the time, they might have wondered why that particular ship had taken the route it did to the islands. A far-north approach, passing the icy Aleutians. Today we know that the four Japanese naval experts were testing a plan the Japanese had been counting on for almost ten years. Much to their gratification, the Japanese naval officers sighted neither ships nor aircraft on this far-north desolate swath of sea. A month later a fleet of Japanese ships would take this same route to Hawaii, only then it would be for real. The Japanese officers, disguised as stewards, took plenty of shore leave, saw the sights, took snapshots, and spoke with the island natives. They even took tourist plane rides over Pearl Harbor and more snapshots. They were testing a plan, and so far, the plan was on target. The consulate gave these Japanese stewards maps of Pearl Harbor and the military airfields. Just to make certain, they purchased souvenir sets of picture postcards containing aerial shots of Pearl Harbor, views of Battleship Row and the mooring area by Ford Island. Returning to Japan, the naval officers spies were confident; the plan they had had for a decade was the right plan. Indeed, it was the plan they used December 7, 1941, and the United States was indeed surprised. In 110 minutes, 8 big battleships and 3 light cruisers had been sunk or damaged, 188 planes had been destroyed, and 2400 men had been killed. 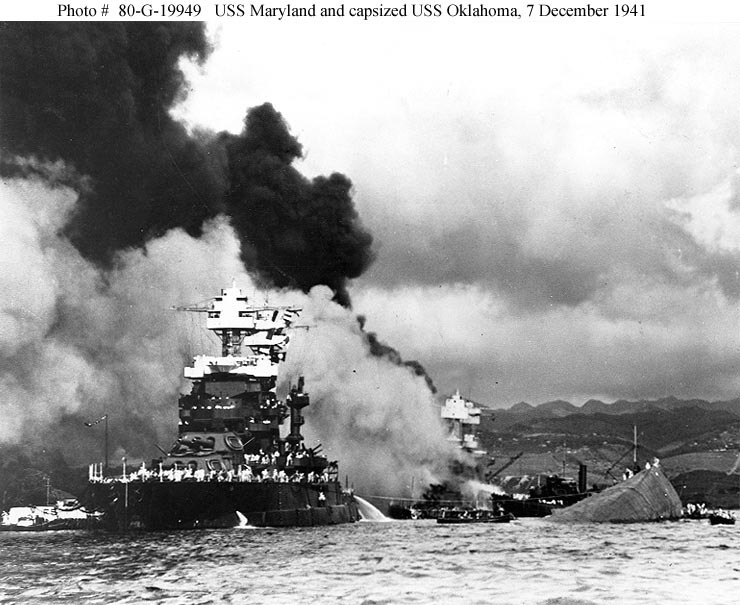 The blow not only paralyzed us in the Pacific for the greater part of a year, it also exposed our inexcusable optimism and our unbelievable unreadiness for battle. Behind our anger was the one burning question: How did they do it? Before 1950, six investigations were launched in search of an answer. The Japanese plan of attack was more than theory: it had been proved effective. 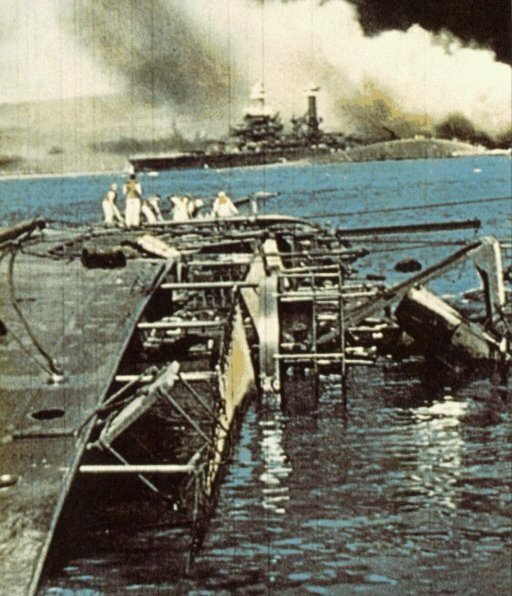 For in 1932 United States Admiral Harry Yarnell decided to demonstrate the vulnerability of Pearl Harbor by slipping two aircraft carriers in close from the northeast. He launched 152 aircraft that theoretically could have obliterated all airplanes on the ground and sunk most of the ships at anchor. Japanese naval attaches in Honolulu read about the exercise, were so impressed that they filed voluminous dispatches to Tokyo. Their report ultimately manifested itself as the Japanese Master Plan. 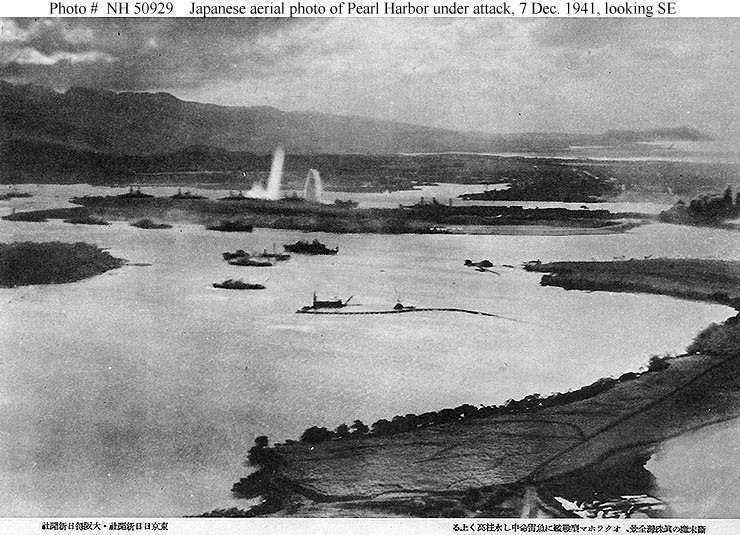 Almost a decade before the surprise attack on Pearl Harbor, we showed the Japanese how to do it! Nice job! Many pics I'd never seen before. Thanks! To think the MSM complains about mistakes our military makes today. I wonder if Michael Moore thinks the Japanese were just defending themselves against the imperialistic Americans? I knew that a Freeper would remember that it was "Pearl Harbor Day". There was a "Dorie Miller American Legion Post" in a town near where I grew up. It was good to read about this brave patriot. Many thanks to your father and my father in law who also served bravely in the Pacific. Didn't mean to be a critic. You did a great job but I am a wing nut! Great post! Pearl Harbor bump! My father was a chief machinest mate in charge of the auxillary engines on the USS Solace on Sunday, December 7, 1941. He was on deck and an eye witness to the entire attack. I've only heard him tell the story twice. We taped him the last time, he was giving an account to my son's boy scout troop. Real heros don't talk about what they've done. And at 95, my father's still going strong. His mind's sharper than mine! !